Manchester United’s manager Sir Alex Ferguson, who has been attracting headlines in recent days for his latest episode of banning a reporter for doing his job, is an autocrat on the brink of yet another record in his extraordinary career. Since taking the reigns at Old Trafford in 1986, he has been the United manager for 999 league games, up to and including last weekend’s win over Fulham. Assuming nothing untoward happens to the 70-year-old Scot between now and the weekend, on Sunday he’ll take charge of his 1,000th Manchester United league game, all of them in the top division in English football. Sunday’s match is away at Southampton. No other football manager – with full control of team selection – has ever managed the same club in the top division of English football for 1,000 league games in an unbroken run. Only three other men have had unbroken runs in senior positions for 1,000 games or more in England with the same club, but all them operated in an era when committees picked the team. They were George Ramsay of Aston Villa, who ‘managed’ them until 1926 and was also a Scot, like Fergie; Frank Watt, another Scot, at Newcastle from 1895 to 1935; and John Nicholson, at Sheffield United from 1899 to 1932. Ferguson’s most illustrious predecessor at Old Trafford, Matt Busby, managed the club for ‘only’ 972 league matches, in two periods in charge. Ferguson’s 999 league games to date have ended with 598 wins, 233 draws and 168 defeats, and he has won an average of 2.03 points per game for almost 26 years. (See graphic below for seasonal details). 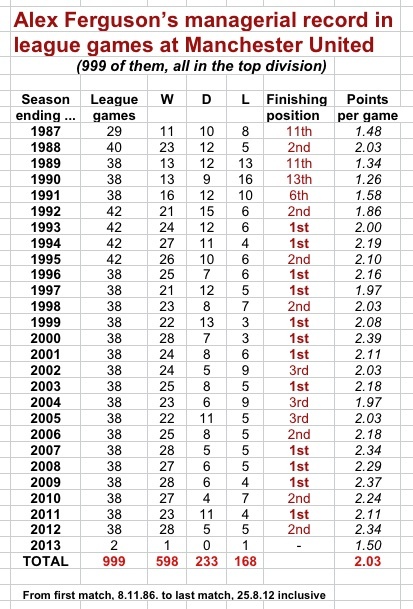 His worst season was 1989-90 when United finished 13th and Ferguson won just 1.26 points per game on average. His best season – among 12 title-winning seasons – was in 1999-2000, when United won the title with 91 points (2.39 per game), winning 28 of their 38 games (a ratio not bettered by Ferguson at United) and losing just three (ditto). Other managers in the English game have been in charge for more than 1,000 games, but they have either been with different clubs or at the same club in a variety of divisions. A list of the longest serving managers by years can be found at the LMA website. Ferguson holds the record for the longest unbroken run of league games at one club in the top division. This is quite possibly why he feels entitled to run United as if it is his own domain.